Rotraut Schrott was an instant success upon first showing her work at a major exhibition in Munich, Germany, in 1982. 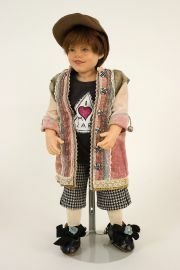 Since that time, her dolls are eagerly sought out by serious collectors and examples of her work reside in most major international collections. Rotraut was born in Frankfurt, Germany. Her father taught her sculpting and painting, continually stressing the importance of understanding anatomy and proportion. 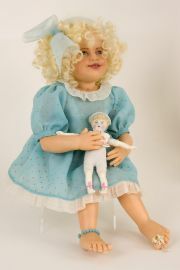 This, of course, lead to Rotraut’s amazingly realistic dolls. 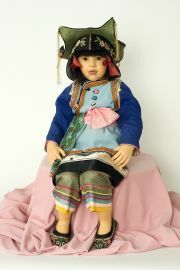 The hands and feet of Rotraut’s dolls are beautifully made, right down to the artfully sculpted fingernails and toenails. 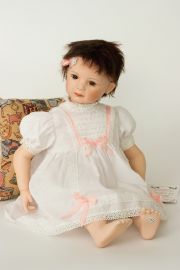 The dolls’ eyes are sculpted of Cernit and painted in a strikingly realistic manner. 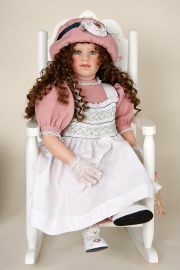 Rotraut’s wigmaker takes special care to produce a wig in color and style to the artist’s specifications. 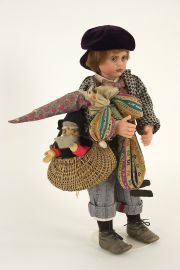 Rotraut’s dolls are dressed in unique and imaginative costumes. Much of the fabrics and many of the trims are vintage pieces the artist finds in her travels through favored flea markets and antique shops. 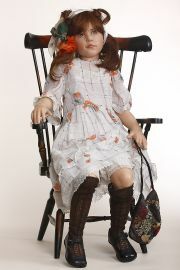 Her dolls’ fashions range from modern to adaptations of period costumes. Rotraut’s inspiration comes from both a real-life study of children and from the portraits of children painted by the Old Masters. “Their portraits of children, with this lovely, soft, sensitive and very expressive painting, let me dream and muse on the mystery of life. All this I would like to convey in my children.” And that is what Rotraut does in an expert fashion.